In churchyard at S. of Parish Church (No. 1610), rough pillar of granite (Plate 7) 3 ft. 4 ins. high above ground, the top cut off flat, 15 ins. wide at its broadest, tapering above and below, 12 ins. thick. It is inscribed along the broadest face in roman capitals, chiselled, reading downwards: ME LI MEDICI!FILI MARTINI!IACIT, the L and I of the first word conjoined, also the M and A of the fourth. 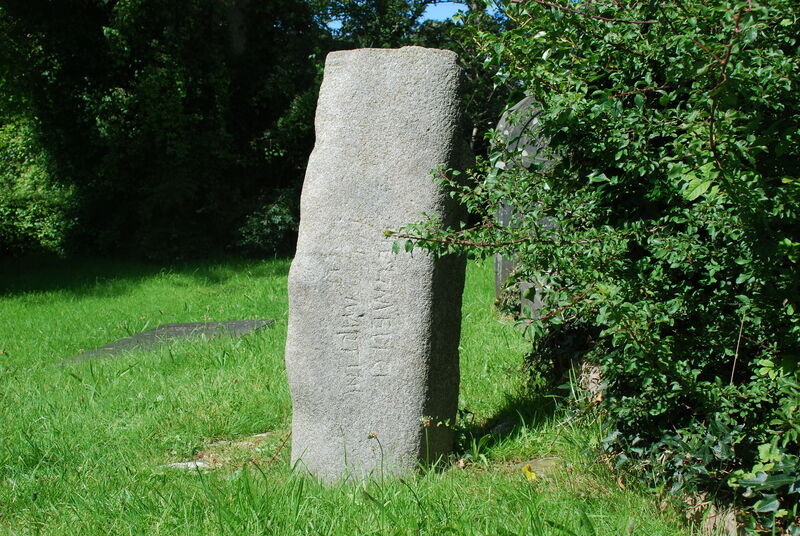 Probably 5th or early 6th-century.1 First noted in 1848, set in a circular pavement and with nails at the top for a sundial;2 possibly in situ or close to its original position in the churchyard. 1 Nash-Williams, no. 92; Macalistcr, Corpus, 110. 386. 2 Arch. Camb., 1848, p. 105.